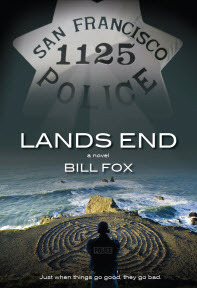 But when I left the SFPD, I’d lost my 49er access, as well. For eight years I made regular inquiries into working for the team— and was rejected. Finally in 1984, the late Ed Salmina, editor of the weekly Novato Advance, requested photo credentials from the 49ers for me to photograph games for the paper. I had a foot in the door. I’d paid my dues doing hundreds of high school and youth league games all over the Bay Area. Literally, I was willing to crawl on my belly five miles over broken glass if that’s what it took to photograph 49er games. Over the next four seasons, 1984 through 1987, I was able to build a solid portfolio of images of Montana, Walsh, Rice and Lott. In addition, I befriended Michael Zagaris, the 49ers team photographer. Late in the 1987 season, “Z-Man” invited me to join the 49ers photographic staff to shoot black and white game action images for the game programs. 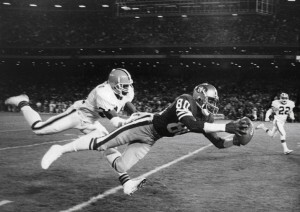 Soon afterwards, on the fourth play of a Sunday night game against the Cleveland Browns, the 49ers had the ball on their own 40-yard line while I knelt along the sideline at the Cleveland 20. As the 49ers broke their huddle and came to the line of scrimmage, something intuitively told me to move. 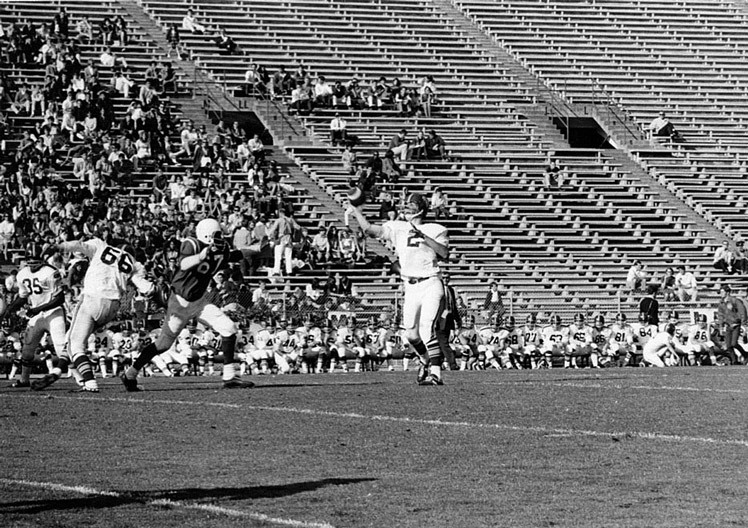 I got up and moved 2 ½ yards to my left, focusing on quarterback Joe Montana with a 600mm lens as he dropped back to pass. When he set up and released the ball downfield, I could see the flight of the ball heading toward Jerry Rice sprinting down the sideline toward me. I came off the 600mm and grabbed another camera hanging around my neck equipped with a manual focus 28mm lens pre-focused on the area right in front of me. I got the camera to my eye as Rice dove and fully extended himself right in front of me making a fingertip catch. I managed to get three images of the catch before Rice disappeared behind the referee standing just to the right of me. Had I not moved, Rice’s incredible diving catch would have been screened from my view. The following spring, the Pro Football Hall of Fame in Canton, Ohio, selected the image as the 1987 First Place, Picture of the Year. That cemented me with the 49ers and allowed me to photograph some of the greatest players, games and plays in NFL history including three victorious 49er Super Bowl teams and the opportunity to travel with the team for the next 20 years, photograph games in 45 different NFL stadiums in every NFL city and win three more Hall of Fame photo awards in 1989, 2004 and 2005. The Rice picture, today, hangs in permanent display at the Pro Football Hall of Fame in Canton, Ohio and in the 49ers new home at Levi’s Stadium in Santa Clara. 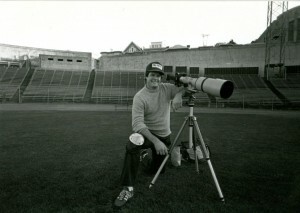 I was sitting on top of the world when one afternoon in May, 2009, I finished an interview for a television feature about my experiences working as the team photographer for the 49ers. When the film crew left, I sat in my office and felt something wasn’t right. I no longer felt authentic. I’d done everything I wanted to in 49er World. I didn’t want that to be my sole identity. Intuitively I felt the need to move, just like those seconds before I took the Jerry Rice picture which launched my career. So, to the amazement of many –including myself – I decided to implode my career. Go out while on top—but to do what, now?